OverviewWhy should you buy your next car, truck, or SUV from Ada Dodge Chrysler Jeep Ram? An extensive inventory and competitive pricing are just a few of the reasons why customers from all over Ada, Seminole, and Ardmore, Oklahoma choose Ada DCJR. See below to learn more! What sets Ada DCJR apart? Ada Dodge Chrysler Jeep Ram, part of the Hiley Automotive Group, is your local Ada, Seminole, and Ardmore, OK. The Hiley Automotive Group, which has 10 franchises across three different states, has been family-owned and operated for 28 years. As your local Ada, OK car dealership, Ada DCJR is proud to play an active role in our wonderful community. We partner with a variety of nonprofit events in the community, including Toys for Tots, the Cancer Foundation for Life, and Christmas with a Cop. In addition, we are proud to sponsor the East Central University basketball and softball teams and provide support for Ada High School organizations. If you're curious about partnership and sponsorship opportunities with Ada DCJR, don't hesitate to reach out. Here at Ada Dodge Chrysler Jeep Ram, we know that auto service can feel like a burden to your busy schedule. That's why we have convenient vehicle service center hours (including Saturday hours) so you can squeeze auto service into your hectic schedule, as well as 24/7 online service scheduling so you can make your next appointment without calling up the dealership. We also provide shuttle service, rental vehicles, and loaner cars so your life doesn't have to be put on pause just because your car is in need of maintenance or repair. When you buy from Ada Dodge Chrysler Jeep Ram, you won't just receive competitive prices and friendly service, you'll also get free pit stops for life. Taking off for a road trip but want a quick tire pressure or oil check? With free pit stops for life, you can pop in for your quick auto maintenance needs. Our trained service staff will check your basics and adjust or top-off your tire pressure, oil, coolant, and other vital vehicle fluids if necessary. At Ada Dodge Chrysler Jeep Ram, we believe that great service starts with friendly, helpful employees. That's why we have a dedicated customer care center to address your auto-related needs. Whether you're looking for a specific new Jeep SUV or are curious about our convenient auto service center, you'll find your answer when you call up our dedicated customer care center. 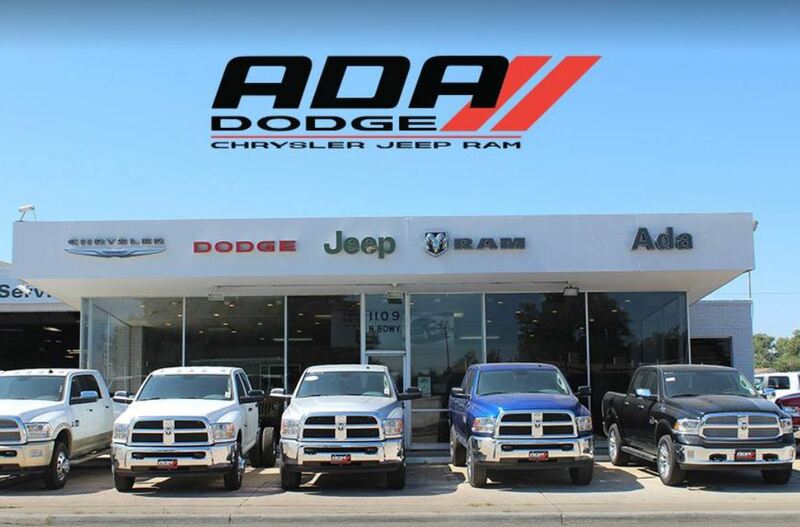 At Ada Dodge Chrysler Jeep Ram, our friendly product and sales specialists are always looking for ways to make your car-buying experience a little easier. That's why our product and sales specialists are knowledgeable and OEM certified to help you understand the ins and outs of all our cars. At our Ada, OK dealership, we want all customers to feel confident and satisfied with their car purchases. That's why every used car on our lot undergoes a rigorous 125-point inspection. When you buy a pre-owned vehicle off our lot, you'll receive both the free vehicle history and our used car guarantee. Buy with confidence at Ada DCJR!